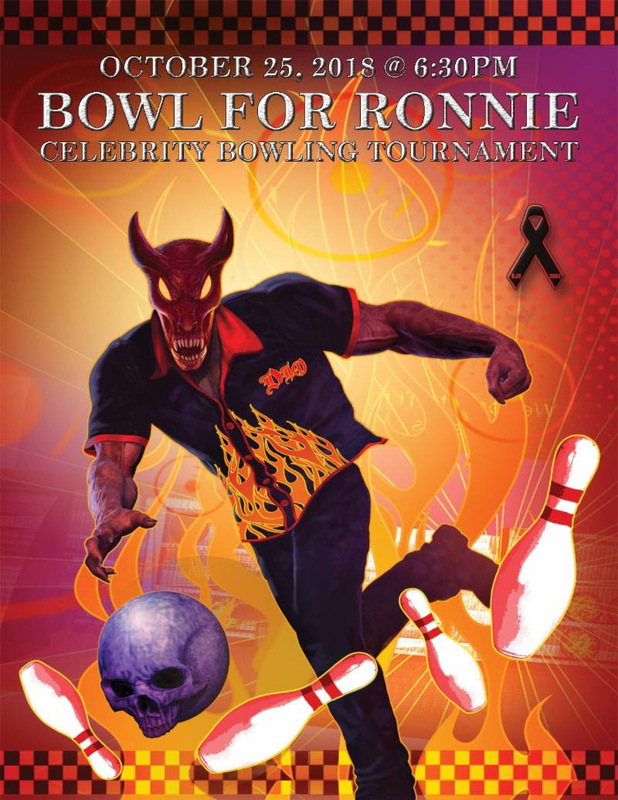 The Fourth Annual Bowl For Ronnie Celebrity Bowling Party, benefiting the Ronnie James Dio Stand Up and Shout Cancer Fund will take place on Thursday, October 25, 2018 at PINZ Bowling Center in Studio City, California. The event will be hosted by television and radio personality Eddie Trunk. Trunk can be heard on SiriusXM's Volume channel and seen on his new TV series TrunkFest airs on AXS-TV. The Bowl For Ronnie event will feature a celebrity bowling tournament and a raffle drawing for prizes and memorabilia. Last year's event brought in $49,000 for the cancer charity, which is now in its ninth year of raising awareness and much-needed funding for cancer research. Members of last year's top two winning celebrity bowling teams, including rockers Marc Ferrari (Keel, Cold Sweat), David "Rock" Feinstein (Elf, The Rods), Fred Coury (Cinderella), Jeff Scott Soto (Trans-Siberian Orchestra), and Chris Latham and Calico Cooper of Beastö Blancö, will return to play in the celebrity competition once again. Among those planning to join them this year will be Steven Adler (Guns N' Roses, Adler's Appetite), Doug Aldrich (Dio, Dead Daisies), Chuck Billy (Testament), Ira Black (Lizzy Borden), Jimmy Burkhard (Billy Idol, West Bound), Brett Scallions and Phil Buckman of Fuel, Kalen Chase (Korn), Jason Cornwell (West Bound), Jeff, Matt and Shawn Duncan (Armored Saint/DC4), Damon Fox (The Cult), Chuck Garric (Alice Cooper/ Beastö Blancö), Rita Haney, Sonia Harley, Adam Jones (Tool), Alex Kane (The Ramones), Sam Koltun, Rich Sacco and Patrick Stone of Budderside, Johnny Martin (LA Guns, Adler's Appetite), actor/musician Sean McNabb (Lynch Mob), Tom Morello (Rage Against the Machine, Prophets of Rage), Marty O'Brien (Methods of Mayhem, Lita Ford), Otep Shamaya (Otep), Joey Vera (Armored Saint, Fates Warning), Dio Disciples members Oni Logan, Joe Retta, Scott Warren and Simon Wright, Chas West (Lynch Mob, West Bound), August Zadra (Dennis DeYoung), DJ WIll (KNAC) and Diva and Ahmet Zappa as well as actors Elysia Skye, Star Fields (Sons of Anarchy), Al Coronel (The Last Ship), James St. Vincent and yoga expert Sadi Nardini. Event host Eddie Trunk will once again captain a team of celebrity bowlers. A place on Eddie Trunk's team will be auctioned off on eBay and additional participants will be announced shortly. The event kicks off at 6:30 PM with open bowling and a VIP pre-party for lane sponsors, celebrities and their guests. Bowl For Ronnie attendees can anticipate an evening of fun, food, and, of course, bowling with rockers and celebrities competing for trophies in the name of raising funds and awareness for the Dio Cancer Fund. Among the raffle prizes will be a specially-designed bowling ball and pin featuring the Bowl For Ronnie artwork along with a PINZ bowling party as well as many other items.